Everyone here in this room is living on borrowed time. By rights we should all be dead! The only reason that God allowed us this extra ration of life is so we can make life hell for the Hun. RAF Squadron Leader Roger Bushell, the officer in charge of the camp escape committee that carried out The Great Escape. He and 49 of the other escapees were murdered by the SS. Go here to read the rest. Rest in peace Squadron Leader, and may you be present now in the Kingdom no one attempts to escape from. Something for the weekend. Fly Me to the Moon seems appropriate for a year in which we observe the 50th anniversary of Man first setting foot on our celestial neighbor. Written in 1954 by Bart Howard, and originally entitled In Other Words, it was first sung by Kaye Ballard who passed away only last month at age 93. The most famous rendition was that by Frank Sinatra in 1964. It is quite easy to assume that of the many victories won by General Nathan Bedford Forrest during the Civil War, the saddest for him was that of Okolona where his brother Colonel Jeffrey Forrest was killed leading a charge of his brigade. As Forrest himself observed: War means fighting and fighting means killing. As part of Sherman’s drive to take Meridian, Mississippi, read about that campaign here, Major General William Sooy Smith led 7,000 cavalry out of Memphis to rendezvous with Sherman at Meridian. But Smith got off to a late start, and Sherman, waiting for Smith for five days at Meridian, marched out of Meridian on February 20, 1864. 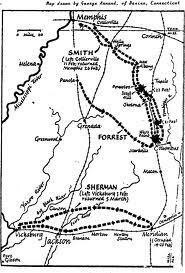 Smith, learning of this, headed bakc north towards Okolona, Mississippi, pursued by Forrest. The pursuit was classic Forrest. Outnumbered three to one, and short of ammunition, it was of course Forrest who was pursuing Smith! Late on February 20, Forrest skirmished with Smith’s force at Prairie Station and Aberdeen, which hastened Smith’s retreat. At dawn on February 22, on the prairie south of Okolona, Forrest opened the attack on Smith’s force, which had dismounted and prepared field fortifications. Forrest’s frontal attack and flank probes quickly caused the Union troopers to retreat, abandoning five cannon. The Federals reformed on a ridge, where Colonel Forrest received his mortal wound. Forrest rushed to his brother, and cradling him in his arms cried “Jeffrey! Jeffrey!”. He then told his adjutant to look after his brother’s body, and led the charge which swept the Union cavalry into headlong retreat, Forrest personally killing three Union soldiers in close combat. Forrest pursued the retreating Federals for eleven miles. A man who was part of the American psyche as I grew up. I was that generational bridge. I’m old enough to have grown up hearing about That President on the Dollar, God Bless America, and of course that legendary Greatest Generation. America was great, our heritage a blessing, and though we had our bad parts – as all civilizations do – our heart and soul was in the right place. I’m young enough to have watched that be dismantled and destroyed. Our racist founders, genocidal imperialists all, our evil and racist government, all white Americans who are necessarily all racist, our military industrial complex funneling money into our baby killing soldiers to oppress the world for oil, and a generation whose soldiers were probably no better than the Japanese or Nazis they fought. But Mr. Mendonsa was from a different, saner and better time. A generation that rose to the challenge and rescued the world from real, not made up or imagined, terrors. Back then, Mr. Mendonsa expressed the exuberance and relief that came with the end to that most horrible of all wars. Today it would be a #MeToo moment. Back then everyone smiled and rejoiced with him, even as they would mourn those hundreds of thousands who experienced the ultimate loss. Today we’d have lawsuits and protests and social media warriors pushing to have him destroyed for being part of the great Evil Nation or the guilty gender; a generation accomplishing nothing but destroying the civilization it inherited, and justifying it through a near addiction to self-righteous contempt for doing anything but criticizing others. Nonetheless, thank you Mr. Mendosa, for what you and your peers actually did in the real world. You were better than us. Perhaps we are your fault, I don’t know. Maybe the greatest generation was the worst parents. But for stopping the actual evils of the time, you rose to the occasion. May God bless you and keep you, and give strength not only to your loved ones, but for the hurting country you leave behind. Go here to comment. Mendosa was a veteran of the Pacific and was home on leave. Greta Zimmer Friedman passed away at age 92 in 2016. She was working as a dental assistant at the time. A Jewish refugee from Austria, both her parents were murdered in Nazi death camps. She later married a World War II veteran of the Army Air Corps. They are buried side by side in Arlington.